From Scribner, an imprint of Simon & Schuster: “In 2009, Tracie McMillan embarked on a groundbreaking undercover journey to see what it takes to eat well in America. For nearly a year, she worked, ate, and lived alongside the working poor to examine how Americans eat when price matters. From the fields of California, a Walmart produce aisle outside of Detroit, and the kitchen of a New York City Applebee’s, McMillan takes us into the heart of America’s meals. She portrays the lives and food of Mexican garlic crews, Midwestern produce managers, and Caribbean line cooks, while also chronicling her own attempts to live and eat on meager wages. Along the way, she asked the questions still facing America a decade after the declaration of an obesity epidemic: Why do we eat the way we do? And how can we change it? To find out, McMillan goes beyond the food on her plate to examine the national priorities that put it there. With riveting narrative and formidable investigative reporting, McMillan takes us from dusty fields to clanging restaurant kitchens, linking her work to the quality of our meals—and always placing her observations in the context of America’s approach not just to farms and kitchens, but to wages and work. 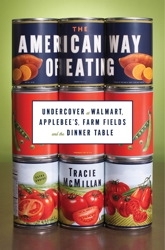 McMillan’s book, The American Way of Eating, went on sale February 21. (Washington) The Fund for Investigative Journalism (FIJ) is proud to announce that Ethics and Excellence in Journalism Foundation has awarded $100,000 for FIJ’s support of independent investigative journalists. FIJ is one of 19 journalism organizations to receive significant grants from the Oklahoma City-based foundation. Most of the foundation’s grants this year were awarded for nonprofit investigative reporting, and “are primarily start-ups with exciting new business models, each filling a void left by traditional news organizations,” said Bob Ross, president and CEO of the Foundation. The support for FIJ will provide grants and editorial guidance for independent investigative reporters, financially support accountability reporting in the U.S., and help address the gap in coverage once offered by traditional media. The Foundation has been a steadfast supporter of FIJ for the past several years. “We are grateful that the Ethics and Excellence in Journalism Foundation shares the mission of the Fund for Investigative Journalism and continues to demonstrate its faith in FIJ’s grantmaking program for independent reporters,” said board president Brant Houston. For more than forty years, FIJ has made grants that cover the expenses of reporting for investigative journalists who have great story ideas, but need resources to complete their work. The Foundation also granted $150,000 for the investigative fellowship program operated by the Schuster Institute for Investigative Journalism at Brandeis University. The Schuster Institute, founded by Florence Graves, recently formed a partnership with FIJ that has already resulted in fellowships for seven FIJ grantees. Read details on the $1.5 million in grants just awarded by the Ethics and Excellence in Journalism Foundation here.